Talent Acquisition is one of the most important and critical task in the HR Manager’s task list. Understanding the need to recruit fresh talent into our workforce, we had planned for a Freshers’ Drive for all the 2016-2017 Engineering graduates from the IT/Computer Science and Electronics background on the 17th of June 2017. We were pleased to see lots of lively and fresh faces on the morning of the Drive. Students had traveled from diverse locations as far as Delhi, Bhopal, Indore, Bhubhaneshwar & Jamshedpur. After making them comfortable in our new office , we started with our rounds of selection. The first round was of Group Discussion with a group of 8 students in each group. Before starting the GD, we gave the group a briefing of the plethora of opportunities available in the Software Industry specially in an IT Product company as ours. We also tried to understand their preference of job role. The topics given for Group Discussion were interesting & generic in nature. The panel was looking for good communication skills, clarity of thoughts and confidence as criteria for selecting students from this round. 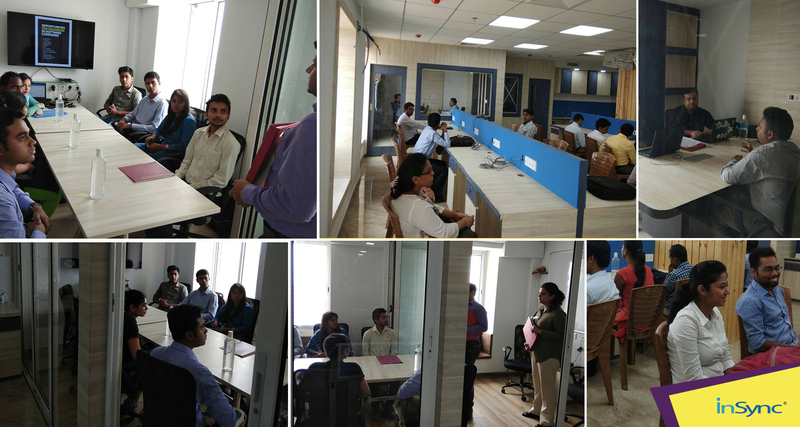 Students selected from the Group Discussion were forwarded for the next round of Technical Interview. It was a long day for us but the experience was amazing to interact with so many young talents full of energy and enthusiasm trying their best to charter a robust career path for themselves. It was an experience in itself to watch them, some looked happy, some tensed and nervous while others just trying to understand the flow of things. My very best wishes to all of them!!!! I look forward to meeting and interacting with more such young talents. If you are one of them,wait no longer and contact us at jobs@insync.co.in We can also follow us on campuseconnect to be updated on the upcoming events.